You seriously can't make this stuff up. Unless you have been living under a rock lately I am sure you are aware that Samsung recently released a new smartphone called the Galaxy Note 7. This phone had some issues where it would spontaneously catch fire. There was a massive recall and Samsung replaced the problem phones with new phones, but those phones would also catch fire. So now Samsung has ceased all production of the Galaxy Note 7 and the FAA has made it a federal crime to bring one on board a commercial airplane (similar to how weapons and explosives are prohibited). 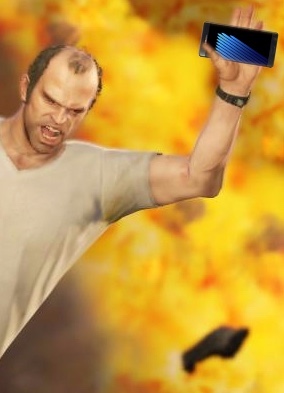 This gave someone the idea of making a modification to Grand Theft Auto V (a popular 1st person shooter style game) such that a bomb in that game is replaced with the image of a Samsung Galaxy Note 7. Videos of this modification have gone rather viral over the last few days and as a result Samsung issued a DMCA takedown request on this video. Initially YouTube took the video down, but upon further examination of the request YouTube realized that the DCMA claim didn't apple to parody. So the video and many others like it are still alive and well on the internet. I find it ironic that a company that has no problem copying other company's designs is now crying foul over a parody video. That takes some real nerve. Maybe if Samsung spent less time and money stealing other companies intellectual property and therefore having to spend money paying their lawyers to defend that theft they could have spent more on product design and this whole issue could have been avoided. And then even after the issue surfaced, maybe Samsung should have taken it more seriously and actually found the real root of the problem so their replacement phones (which they obviously rushed out the door as well) didn't have the same problem. I may be a huge Apple fan, but I really do hate seeing Samsung fail like this. I want to see Apple's competitors put out really good products to keep Apple on their toes so the pressure is kept on Apple to innovate. So this is not a good thing in my book. But in the mean time I am going to enjoy the entertainment in these videos. Below is one such video and it is one of the less violent videos (some of them get pretty graphic a vulgar...it is GTA V after all).